Click on the actual VMWare server (this has the small server icon) and go to the “configuration” tab. anything to the left of the blue line is virtual and is hosted on the VMware esx server. This is very advantageous to test the open source routers and pass actual traffic through them, if you have a very small testlab. Make sure not to select any physical interfaces. The VM hosting the virtual router usually is configured with two or more interfaces. 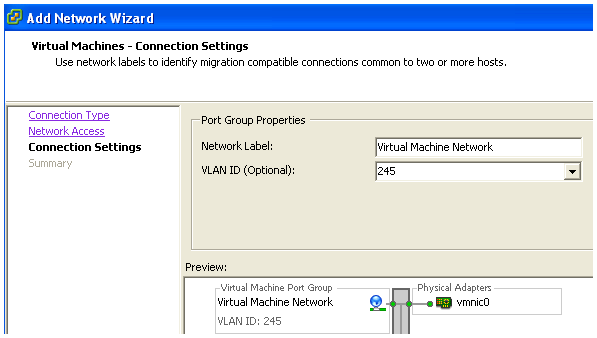 In the VM networking properties (Edit virtual machine settings > network adapter, from the “network connection” select the appropriate switch just created. 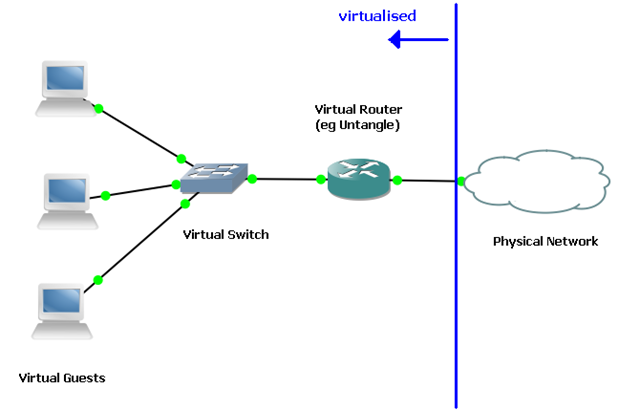 In the above example, one of the NICs is connected to the “LAN_Isolated” switch, and the other to the “VM Network” switch. 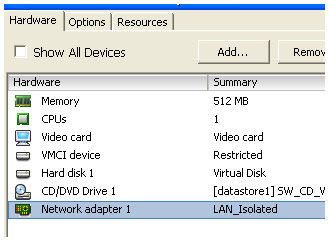 The “LAN_Isolated” switch is not bound to any physical interface as described above, and this servers as the LAN interface of the virtual router.